So You Wanna Be a Gallerist? Shop For Sale! Well, my friends, my retail partners and I have some very big news. I'll just come out and say it: it's time for CakeSpy Shop's brick and mortar location on Capitol Hill, Seattle to pass the torch to the next fantastic retail business. DO NOT BE SAD. CakeSpy as a business and product line is not disappearing, but we've decided to go down different paths than the gallery. While it might be a surprise to some, really, it's ultimately a good thing - and possibly a great opportunity! It has truly been an amazing experience to share CakeSpy with so many amazing people in this format. It's been humbling to have visitors from far and wide come to share wonderful art, food stories, and of course to buy CakeSpy (and other) art! But ultimately, as the business has grown, the retail gallery has been less and less aligned with the company's mission, especially with my cookbooks--as you might expect, many would come to the store and expect a bakery! So, it's not so much a sad thing as a "time to shift gears" sort of thing. We do not have a definite shift date yet, but in the meantime, fans of the shop or friends who haven't yet had a chance to visit: make it happen now! Guaranteed that the amazing products and generally feel-good business will make you smile. Or shop online! Hello Customers and Friends of CakeSpy Shop! As some of you may know, Jessie Oleson, founder of CakeSpy, moved to Philadelphia a number of months ago to take advantage of an artist grant that would help her advance and grow the CakeSpy name. During that time, Danny Oleson and store manager Natalie Samford have been taking care of the store. As the CakeSpy brand has evolved during this time and Jessie has pursued writing cookbooks, the retail store fits less and less with the overall mission--understandably, after reading the blog and her books, many customers expect the store to be a bakery! As a result, we've lovingly decided to sell the retail storefront business, and we wanted let you, our wonderfully supportive community, know what was up. As those of you who were customers of Bluebottle Art Gallery before us know, when Jessie and I took over the store, we changed the name, but we continued the tradition of featuring innovative, exciting and local and national artists making unique products that you can't find elsewhere, and we want to sell to someone who will continue that tradition. The store is perfect for someone who wants a working studio where retail hours can be kept, and if the new owner has their own wholesale business, it is perfect for storing product and fulfilling orders. 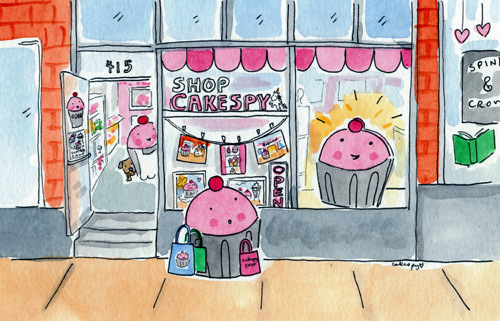 Please note that while the name "CakeSpy Shop" will not be included in the sale, all of the store fixtures (including newly installed lighting and flooring!) will be included, and the buyer will be entitled to maintain all of the consignment products in the store and is permitted to use the name "Bluebottle Art Gallery" if desired. This is to say--everything is available except for the name "CakeSpy Shop". So, interested in taking over a wonderful gallery? Oh, goody. A built out and stocked store - purchase will include existing wholesale stock, furnishings and equipment save a couple of exceptions, and existing consignment relationships so that the current consignment stock will carry over for those artists who choose to continue their relationship with the store. A software system that serves for point of sale, inventory management, expense tracking, consignment payments and more. Talk to us to find out more! Please email cakespyshop@gmail.com. Unfortunately, emails sent to any other address will not be able to be answered.